Get comfortable, breathe healthier air, save money and protect the planet with our simple solution. You’re not getting the most out of your heating & air system. Did you know 20-30% of the air that’s supposed to blow through your vents is escaping through cracks and holes in your air ducts? You could be wastefully heating and cooling areas like your attic, crawl space, and even behind walls. Not only that, dust, debris, and allergens are being sucked in and blasted all over your house. Yuck! This is why your bedroom is freezing, your coffee table is always dusty, and your energy bill is through the roof. The good news is… we make it easy to fix. This homeowner wanted to lower their energy bills and had just put in a new furnace with hopes of getting a greater return on their investment. It wasn’t happening. They were also seeing inconsistent temperatures throughout their home, as well as excessive amounts of dust. That’s where Aeroseal stepped in. 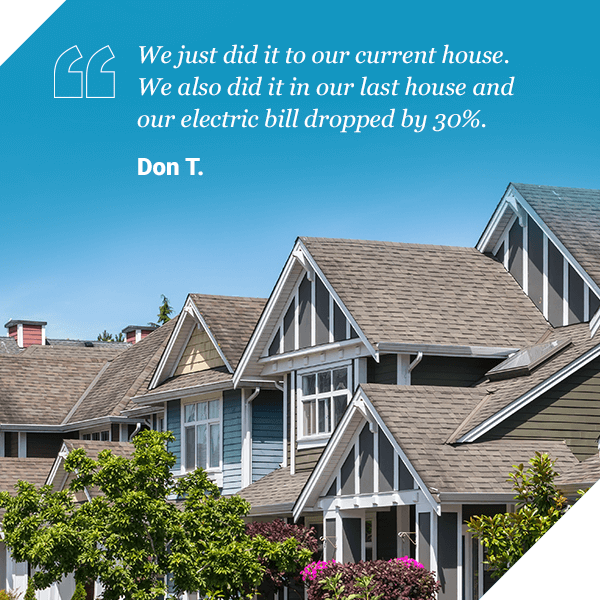 See how Aeroseal fixed their problems and provided a more comfortable home with healthier air, all while lowering their energy bills. The combination of cutting-edge technology plus a simple and safe sealing formula. Aeroseal’s smart technology finds the exact amount of leakage in your system and targets all of the cracks and holes – even the ones you can’t see and can’t reach. Our formula is safe, non-toxic and made of the same material that is found in chewing gum and baby pacifiers. Best of all, our non-invasive process takes only a few hours, with little-to-no inconvenience nor clean-up needed. An American company with American-made technology, delivered locally. For over 20 years we’ve improved hundreds of thousands of homes as well as hospitals, hotels, and universities. We hold a simple belief – to help people make their homes more comfortable, their families healthier, and the environment cleaner, making their homes AND the world a better place. The U.S. Department of Energy calls Aeroseal one of the most beneficial energy technologies for American consumers. Enjoy every room in your house. No more hard-to-heat spaces. You’ll even sleep better. Say goodbye to dirty air, allergens, and contaminants blowing all over your house. Realize an annual savings of $400 – $700 per year on your heating and cooling bill. You’ll get the most out of your system – more air from your vents and longer system life. Be proud of a more efficient home. You’ll save money and the planet at the same time. We’re in and out of your home in a few short hours. You’ll feel the results immediately.